"What you measure is what you get." Our focus is on Asset Management or an even more extensive Portfolio Management which we provide Germany wide. The Asset Manager utilises the Property and Facility Management to drive the value of the investments. The objective is to ensure or exceed calculated yields while increasing the capital value. This is a delicate balance as value improvements may effect the immediate yields. Therefore it is key to establish the investment philisophy at the outset, e.g. through interviews with the stakeholders of the investor. As Asset Managers we look at the entire existing portfolio with regard to any planned portfolio changes. We investigate the cost and income structure to identify opportunities for improvement. This can be active Supply Chain Management, combining the entire portfolio and in the next step bundling the buying power of different portfolios we manage in negotiations with suppliers. We establish a rolling Capex Budget Plan which is kept up to date with the actual needs. We identify those investments that might bring a quick win through improvement of the rental situation. Based on a detailed scope of works we develop based on the investment philosophy of the investor, we help to identify and contract appropriate service providers for Property Management. Main tasks for the Property Manager is rent collection, dealing with tenants and service providers, maintenance and repairs within the framework set by the owner or his Asset Manager. We have developed a system of Service Level Agreements with Key Performance Indicators (KPI) for Property Management including performance reviews and evaluations. We always incorporate a performance based element into any management fee, including our own. For an example item for an SLA go to the end of this page. There is also the aspect of measuring the performance of each property in a portfolio and the entire portfolio against the business plan at the outset. This aspect is reflected in our performance focussed reporting. We develop a reporting structure and make this part of any contract with Property Managers and/or Facility Managers. It defines time and contents of any regular or ad hoc reports. 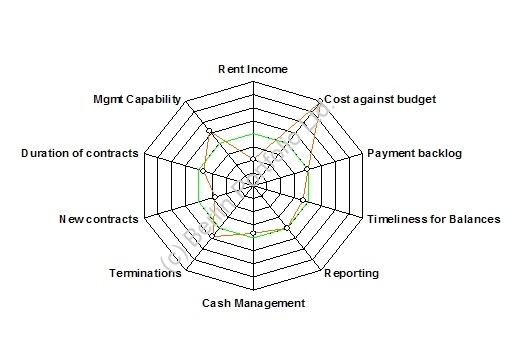 A summary report by the Asset Manager is available to the owner on an internet based Client Portal and is the Executive Dashboard. Applying the Balanced Scorecard philosophy this report contains the actual data and performance against agreed targets. Besides the obvious like rental income, this might include tenant turnover (as a measurement of the customer care by the Property Manager), the meeting of reporting deadlines and financial management and other goals that are important to the investor. Operational reporting is also of growing importance for lenders. Not only in cases of securisations extensive quarterly reports are required. Because financial institutions have to perform a risk assessment before any lending, if the investor can show that he has his own risk management in place it will influence the interest rate positively. We establish and agree a risk matrix with the owner and actively manage it during the operational phase. As a guideline we have prepared a generic Outline Proposal which will be detailed in each case for each investor and Property. For more information about Asset Management and the Outline Proposal please make your request through the Feedback page. Main tasks for the Property Manager is rent collection, dealing with tenants and service providers, maintenance and repairs within the framework set by the owner or his Asset Manger. We provide the procurement process to contract Property Management which meets the client's specific needs and produces synergies and savings. The Property Management is the No.1 factor determining the performance of a property. More details are in the Property Performance section of this website. Facility Management is one of our main consultancy areas. We have introduced Service Level Agreement based contracts for Facility Management into the German Market. We use this detailed market knowledge as leverage in negotiations with service providers. Through intelligent bundling of services we have achieved significant savings with improved client satisfaction for both the owner and the tenant. We have developed a system of Service Level Agreements (SLA) with Key Performance Indicators (KPI) for Property Management and other property related services like facility management. A vital part for the system is the inclusion of performance reviews and evaluations. We always incorporate a performance based element into any management or service fee. In order to be able to measure results these results have to be defined and just as important a measurable unit has to be associated to it to determine the degree of fulfilment of the desired results. An example: You want correct and timely reporting because that is also what your bank or your shareholders expect from you. So you have to define what the content of the report has to be. This would be your very rough service level for “reporting” in your service level agreement. The next steps are the measurements for the delivery of the results (key performance indicators, KPI): There should be no errors in the report. The report for the previous month should be delivered to your e-mail or uploaded on a reporting portal at the latest by the 10th of the following month and in hard copy 2 days later. But of course this is only half the job. Thanks to the KPIs you can measure the fulfilment: Number of errors and days of delivery after the 10th of the following month. Now you have to define the consequences of this non-compliance. This is done by attributing points to the various KPIs, say per error 10 points reduction and per day of delay another 20 points. If the amount of points reaches a certain level there will be fee-reductions. If it becomes unbearable you have measurable results as grounds for a contract termination, a very strong argument should there be a discussion or even legal action. These service level agreements and key performance indicators are very powerful instruments for managing the performance of your property portfolio and services generally. They should not be seen and used as a means of fee reduction after signing a contract. Actually you want to pay the full fee agreed because then you know that everybody is performing as they should. The setting of the points for the KPIs requires some skill and a clear strategy of what you want to achieve. By giving certain areas like renting of sales support special weight you set the points high. This will be a strong motivator for your property manager or asset manager to perform especially well in these areas as there is a likely punishment for failure. This aligns the actions of your service providers with your goals. © 2017 Falkenberg Solutions. All rights reserved. Impressum, Disclaimer and Privacy Statement click here.